Last night, for no cosmic or earthly reason, I had a strong feeling to watch a play, especially a Samuel Beckett's, but it was half-past twelve and there was no remote possibility of a theatre staging a Beckett or any other play at that point of time in any part of the city. The Great City Streets, each one of them named after a historic man (or, in few cases, a historic woman), began to embrace the night sky in all his glory. Except one. The One that lies exactly one thousand five hundred and eighty-five meters away from my apartment. The street was making trammelling sounds along with worn out, frustrated, and overburdened trucks. You know about the trucks. They allow them to enter the city, after nine or ten o clock something and ask them to leave as soon as possible before they could be caught by the Sun and the city dwellers. The story repeats itself night after night. Thousands of trucks enter the city with all their hope and despair. They spend a night with the street. Get their work done. Leave the city, again with all their hope and despair. Meanwhile, for a moment, some trucks leave their frustration, and some will find a way to do so, in near future, but the street remained the same, waiting for the approval and acceptance. The only time I saw her smiling when there was a ban on the entry of trucks in the city of cities. Coincidentally, it was one of 'those' rare happy days in my life. I got my paycheck cleared, which was stuck for almost six and a half month, and I was literally on the cloud nine. In those nights, the street was not making any money, but she was happy. There was no smile on her face, but she was smiling through her eyes. She was wearing no makeup, yet she looked stunningly ravish in those neon street lights. 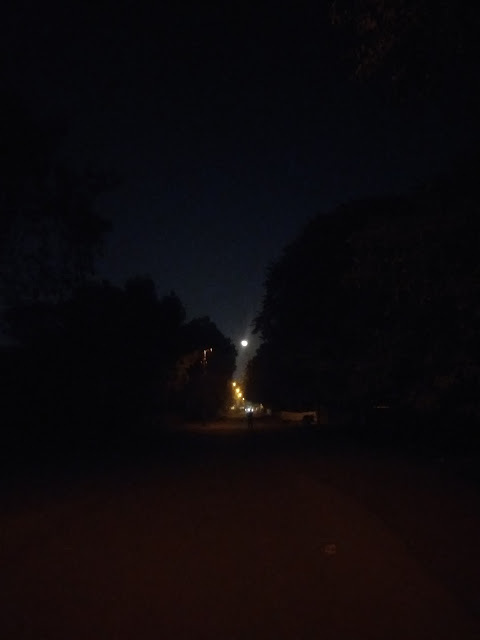 One night, when I was late for home (can't remember the reason) and passing by her side, she smiled at me, when our eyes incidentally met, I bleakly smiled in reply. She smiled again with her eyes and I smiled with my lips a little wide. She asked for the time. I told her, it's ten past eleven. Then, there was an awkward silence, and a moment later, I began to move. Out of nowhere, She asked me for tea, and don't know why I nodded in 'yes'. She told me that she knows me. She has seen me, many times, gazing at the stars while roaming the streets nearby. She had a name for me, "the Stargazer." When I asked her, "Why?" She told me, "Because you are always looking at the stars and the night sky." She asked me, "Why you do this?' I answered, "Don't know why?" and at the same time, don't know when that one cup of tea ended up in the fourth cup. We talked for straight two hours about anything and everything, from stars to current political wars. Finally, before parting, I confessed, I also knew her and saw her many times through my theftful eyes. She smiled, and said, "I know." Last night, I don't want to see Beckett. I want to talk to her, but she was busy with those worn out, frustrated, and overburdened trucks, making those trammelling sounds, to earn her living. amazing thought and well written. loved it.